In 2012, Pulitzer Prize-winning journalist Amy Ellis Nutt began reporting on a family that is ordinary in many ways – middle class, politically conservative, from rural America – with one exception: one of their identical twin sons, at the age of about two, began identifying as a girl. 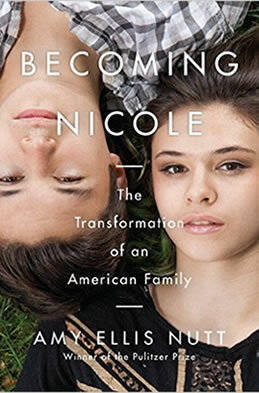 On October 20, 2015, Random House is publishing BECOMING NICOLE: The Transformation of An American Family, a book about gender identity, transgender rights, community, and, above all, a family tested beyond what they could ever imagine. It’s also a book steeped in the history of transgenderism, putting Nicole’s story into a larger cultural and medical context. Kelly and Wayne Maines were a hard-working, devoted New England couple whose lives felt complete when they brought home their adopted identical twin sons. But the boys’ personalities began to take fundamentally different shapes. Jonas was the son they expected—all boy. But Wyatt was just the opposite—interested only in girls’ clothes and toys. The family struggled with what this might mean, initially hoping that Wyatt was passing through a phase. But by age five Wyatt’s inner conflict began tearing him—and the family—apart. How the family responded, eventually embracing their son as a daughter, Nicole, lies at the heart of this story. Their journey united them in a cause and moral purpose they never would have imagined for themselves. Wayne transformed from a conservative, Air Force veteran with no experience with LGBT issues, to a proud father and fighter for his daughter’s rights. The Maineses were at the center of a groundbreaking lawsuit that expanded equal access for transgender children in schools and brought them national attention. Nicole and her family have granted Amy Ellis Nutt full access to their lives, giving her hundreds of hours of interviews and sharing personal emails, diaries, photos, videos, and medical records. Amy has been witness to many milestones in the family’s life and Nicole’s transition. The twins are now seventeen and headed off to college and BECOMING NICOLE is the rich, immersive story of their journey. Granted wide-ranging access to personal diaries, home videos, clinical journals, legal documents, medical records, and the Maineses themselves, Amy Ellis Nutt spent almost four years reporting this immersive account of an American family confronting an issue that is at the center of today’s cultural debate. BECOMING NICOLE will resonate with anyone who’s ever raised a child, felt at odds with society’s conventions and norms, or had to embrace life when it plays out unexpectedly. When Random House Executive Editor David Ebershoff acquired BECOMING NICOLE in early 2013, little did we know that 2015 would be a watershed year in the trans movement: Laverne Cox has become a superstar; Caitlyn Jenner is telling her story in powerful ways; and in November newly-minted Oscar winner Eddie Redmayne will play an early transgender pioneer in The Danish Girl. BECOMING NICOLE, through its story of one girl and her family, illuminates a complex social and political issue so many Americas are curious about.